Record Anywhere with X/Y or Mid-Side Stereo Microphone Capsules! The Zoom H6 Portable Digital Recorder is a strong addition to any professional media rig. 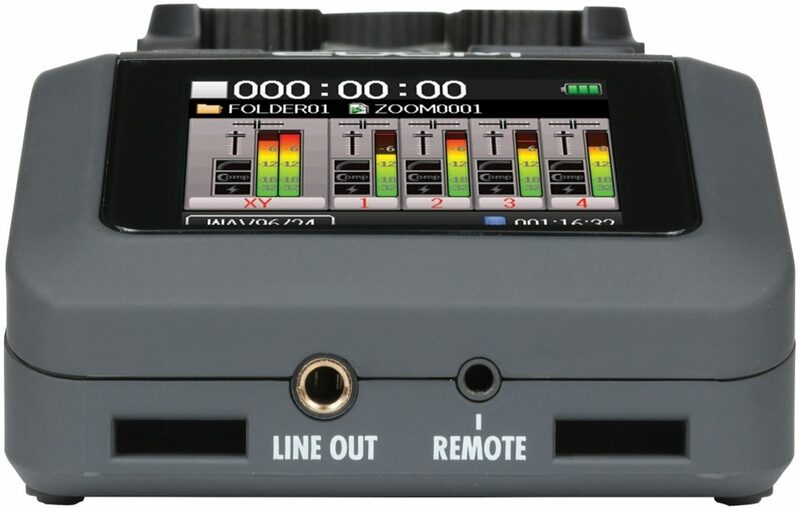 This compact, professional-quality six-channel audio recorder includes four 1/4-inch/XLR combo jacks which accept balanced or unbalanced connections, each with independent gain control. Interchangeable modules provide the remaining two input channels, with included X/Y microphone and Mid-Side microphone modules for recording environments in stereo. With all these features and more, the H6 is ideally suited for live or studio recording, videography, and electronic news gathering. 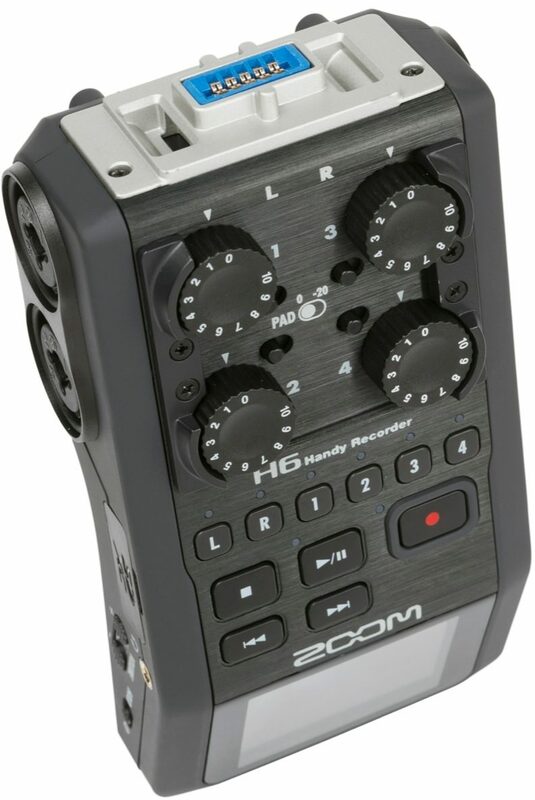 The Zoom H6's outputs are a 1/8" line out for connecting to video equipment or headphones, and USB out for digital connection to your computer. When connected via USB, you can quickly transfer files to your computer -- or use your Zoom H6 as a 6-channel digital audio interface. The H6 features an SD card slot and supports recording directly to the card. A full-color display shows virtual VU meters and is used for menu navigation. A truly portable recording solution, the Zoom H6 runs on four AA batteries and boasts a battery life of over 20 hours of use. With the H6's powerful features, you'll never miss a moment. With the Pre-record function, the H6 is always capturing audio whenever it's on -- so you never even have to press a button. Enable the Auto-record feature, and the H6 will begin recording when it senses volume above a specified threshold. The Backup-record function saves a second copy of your WAVs at reduced gain, so if your audio comes out distorted, you'll always have a clean backup. This handy recorder is simply packed with indispensable tools for live audio recording. Plenty of portable recorders come with built-in condenser microphones, but the Zoom H6 improves on this with interchangeable microphone attachments. 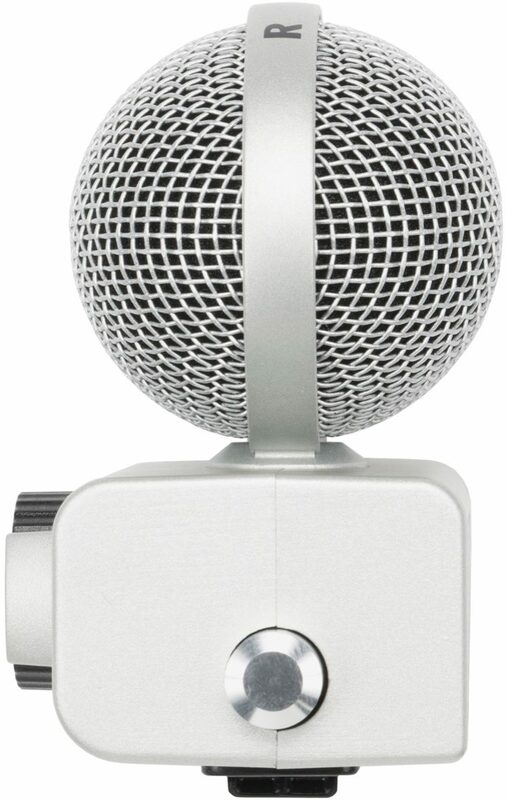 Connect the included X/Y stereo microphone pair, and adjust them between 90 or 120 degrees to capture a live performance, room ambiance, or outdoor environment. Want to record voiceover, dialogue, or a solo instrument? Attach the Mid/Side microphone pair to capture any source with the middle/side microphone technique. With the middle microphone and side microphones recorded on two separate tracks on the Zoom H6's SD card, you'll be able to adjust the width of the stereo field in postproduction, so your recording has more or less "room." If you're recording voiceover, shooting a documentary, or recording dialogue for film, the Zoom H6 can accommodate an optional shotgun microphone attachment. Combined with a hot-shoe attachment and the optional Zoom SGH-6 H6 hyper-directional shotgun mic, the Zoom H6 can transform a DSLR camera into a professional reporting rig. Your Zoom H6 comes with four combination 1/4"-XLR inputs, each with their own hardware gain knobs, for connecting microphones or line-level sources. If you'd like to plug in even more external inputs, you can add two more with the optional Zoom EXH-6 H6 dual XLR/TRS input capsule. With this capsule attached to your Zoom H6, you can record a full 6 external inputs to 6 individual tracks. With all these attachments and tons of functionality on board, the H6 is truly the most versatile portable recorder Zoom has ever produced. The ground-breaking Zoom H6 handheld recorder will change the way you think about portable recording. With interchangeable stereo X/Y and Middle-Side microphone capsules included, plus Shotgun and Dual XLR/TRS Combo input capsules available separately, the H6 is the ultimate chameleon of the audio world -- and its advanced preamps make it the best-sounding one too. Whatever your application -- live recording, professional film/video work, or broadcast ENG -- the H6 can handle it with ease. The H6 offers four main inputs (1-4), plus two additional inputs (L, R) that are derived from whichever capsule (X/Y, MS, Shotgun, or Dual XLR/TRS Combo) is plugged into the unit. The supplied XYH-6 X/Y capsule also provides a secondary input for connecting an external mic- or line-level signal via a stereo 1/4" Mic/Line In mini phone jack. When a connection is made to that jack, signal from the X/Y microphones is muted. 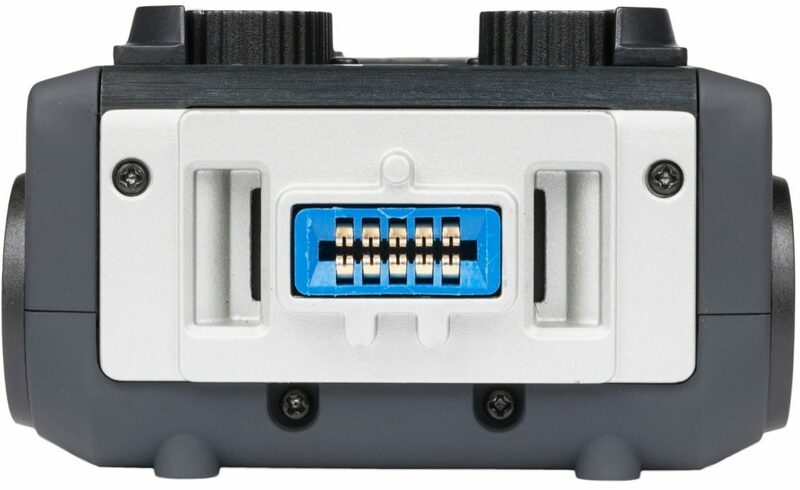 All four main H6 inputs (inputs 1-4) are combo connectors that can accept either XLR or 1/4" balanced or unbalanced phone cables. They can handle both mic- and line-level signals, which means that you can connect either external microphones or line-level devices like mixers, portable music players, electronic keyboards, or electric guitars or basses with active electronics (passive electric guitars or basses can also be connected with the use of a mixer or effects device). Internal switching contacts automatically detect the circuit of choice. Each of the six inputs (that is, 1-4 as well as L, R) has a dedicated gain control knob. In addition, the four main inputs and the EXH-6 capsule feature a -20dB pad, allowing you to prevent distortion even when high-level signals are introduced. In fact, with the use of the Pad switch, the H6 can input a signal 30dB louder and 14dB softer than any other Handy Recorder model. In addition, all capsules utilize higher voltage preamps (5 volts instead of the more commonly used 3 volts) for distortion-free recording, even at high volumes. A built-in instrumentation amp allows signals to be transmitted with minimal noise even when long cables are used. If you're using high-quality condenser (powered) microphones with the H6, no problem -- a simple menu option allows the unit to provide Phantom Power (either +12, +24, or +48 volts) to any or all of the main inputs (inputs 1-4). Inexpensive condenser microphones requiring Plug-In Power (2.5 volts) can be connected to the X/Y capsule's stereo 1/4 in. Line In jack. The H6 Line Out is an unbalanced stereo 1/4 in. phone jack, located on the bottom of the H6, beneath the LCD display. It carries the analog stereo output signal, as determined by the H6's internal mixer. In addition, the H6 provides a headphone output with a dedicated volume control, located on the side panel to the left of the LCD display. Connect your headphones to the stereo ? in. mini phone jack for private monitoring of the stereo output signal. The X/Y stereo miking technique is optimal when you want to cover a wide area and still capture sound sources in the center with clarity and definition, making it great for all types of live stereo recording. 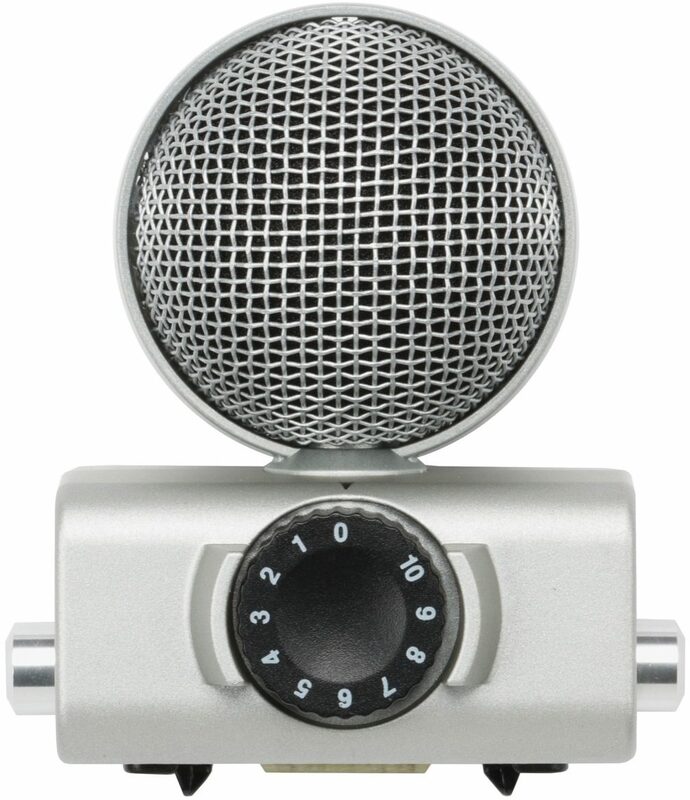 The supplied XYH-6 X/Y capsule adds two matched high-quality unidirectional microphones to your H6. 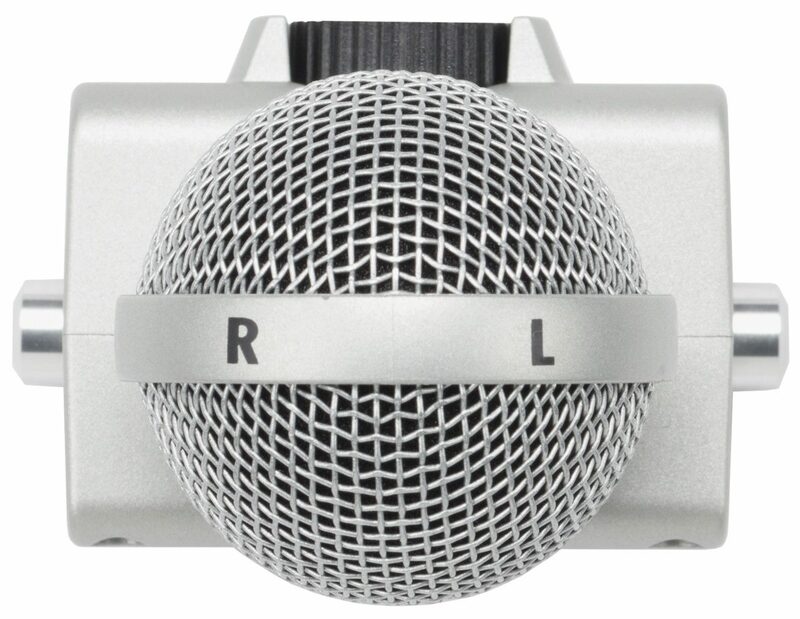 This kind of microphone is most sensitive to signal coming from directly in front, and less sensitive to signal coming from behind or from the sides; in technical terms, they are said to utilize a cardioid polar pattern. These mics have the largest diaphragm size (0.579 in. = 14.6mm) of any ever available on a portable recorder. The angle of the two mics can easily be changed from 90 degrees to 120 degrees for a wider stereo image (US Patent 8184815). Thanks to the three internal mics with digital signal processing ability, the SGH-6 achieves a frequency-independent super-cardioid polar pattern. Compared to ordinary shotgun microphones using an acoustic tube method, the SGH-6 maintains a highly directional pickup at about half the length. Use the X/Y capsule to capture the overall sound in stereo, then use the other four inputs for a direct feed from the mixing board, or for external spot mics to pick up specific instruments and the room sound. With the H6, you can make a detailed recording and relive that great performance night after night. MP3 recordings are compressed, which means that some unnecessary data is removed prior to storage, making them much smaller than WAV files, and thus much easier to upload and download. Some MP3 files exhibit a slight loss of audio fidelity as compared with the original signal; however, this is not noticeable in all circumstances. Note that when the MP3 file type is selected, the H6 only records in stereo; if you want to record in multitrack, you must select a WAV file type. The H6's internal mixdown function allows multitrack WAV projects to be easily reduced down to stereo MP3 or WAV, with independent control over each track's level, panning and pitch. The interview started a split-second before you were ready. The conductor lifted his baton just as you were checking a cable. The talent went back on-air a moment too soon. No problem! as long as you're using the H6. Its Pre-Record function automatically keeps the H6 silently but continuously recording in the background, all the time. Then, when you hit the RECORD button, it keeps the previous two seconds and appends it to the beginning of the file. It's as if the H6 had started recording two seconds before you actually got to hit the button. Backup-Record is the ultimate safety net. When turned on during the recording of WAV files, the H6 automatically records a duplicate set of L/R tracks, but with 12dB less input gain. Even if the original L/R track is distorted, chances are the Backup version is fine. You can listen to either set of tracks simply by going to the Backup File option in the PROJECT menu. When turned OFF, you'll hear the original L/R tracks; when turned ON, you'll hear the lower-level Backup tracks instead. Pick the one you prefer and use it as your L/R master. Bacon saved. The Auto-Record function allows the H6 to automatically start recording when a certain level of sound is detected. When turned ON and the RECORD button is pressed, the H6 doesn't immediately start recording; instead, it goes into a standby mode; as soon as an incoming signal exceeds the Start Level you've set, recording begins. There's an equivalent Auto-Record Stop function, too. When turned ON, as soon as incoming signal drops below the Stop Level you've set, recording ends. The H6 provides an arsenal of effects that allow you to add polish to your recordings and compensate for any problems or limitations in the acoustics of the recording environment. - Low-Cut Filter: A low-cut filter allows you to remove signal below a certain user-designated frequency (called a cutoff frequency). This is useful for eliminating pops, wind noise, blowing, transmitted resonance from an onstage mic stand and other kinds of low frequency rumble. - Compressor and Limiter: Compression and limiting compensate for fluctuations in level; in essence, they act like an automatic volume control, reducing the level of louder sounds (that is, the sounds below a threshold point). The main difference between the two is that a limiter reduces louder sounds more severely. The H6 allows you to choose from three compressor settings and three limiter settings. The two "General" settings (Comp1 and Limiter1) are all-purpose settings that will work well on most kinds of program material. The Comp2 and Comp3 presets are optimized for use with vocals and drums, respectively, while the Limiter2 and Limiter3 presets are optimized for use in live concert recording and small room "studio" recording, respectively. - Metronome and Tuner: In addition, there's an onboard metronome and chromatic/guitar/bass tuner -- both handy tools when recording musical content. The H6 requires just 4 AA batteries - either alkaline or rechargeable NiMH - for power. Battery life (when using alkaline batteries) is more than 20 hours, even during continuous recording. An optional AD-17 AC adapter (included in the APH-6 Accessory Pack) allows you to power the H6 from any standard wall socket. The H6 records directly to standard SD cards as well as the SDHC and SDXC cards, up to 128 gigabytes, making it capable of accessing massive data storage. Overall: I just purchased this device from zzounds .com. I've been an amateur recording engineer for 20 years. Of all the portable, compact devices I've used, I've never used one as awesome as this, for the size and price. My first quasi pro recorder was a Fostex multitrack tape recorder. I paid exactly $400.00 for it, 20 years ago. It pales in comparison to the Zoom H6. Out of the box, it was up and running - zero learning curve. At this time, I am a film student. I've worked on sets where the Zoom H4N was used. I was amazed by the quality and versatility of that device. When deciding to make my purchase, I compared the H4N with the H6. It was a no brainer. I chose the H6! The spacial sound stage and stereo depth is mind blowing. I ran it as I simply walked around, drove my car, ate dinner at a restaurant, etc. While listening back, I am totally blown away by the clarity and precision of the audio quality. I am 100% confident I made the right choice. I'm giving it 5 stars for the Manufacturer Support, even though I haven't had a need for support. And this is because their support has been evident by their quest for quality, out of the box. BUY IT!!! Style of Music: Rock, World, Classical, Metal, etc. Overall: For some time now I have pondered what to do for a portable recording system. Laptop or a device like this. Keeping things simple, or just in the realm of what is needed without extras. I went with this. I am very happy I did. The unit is solid, the pots feel nice, buttons firm, display is easy to see, menu simple to use. I use Linux for my production so I can not comment on the ease of Windoze and I-stuff and thankfully Zoom designed this for low level hardware access. Plug and play, direct connect right into the heart of the unit. Within 5 minutes I was up and running, not reading the manual. I had Jack access with full control from my pc to everything that is adjustable in it. The same ease of connection I get with my Emu 0202 and 0404. No extra software layers to deal with like much of the hardware made today, unfortunately. Thank you Zoom for being open with your hardware!!! Using the unit as a DAC is simple, and sounds quite nice. Not as refined a sound as the Emu's, but it is hard pressed to find a DAC that will contend with the 0202 in that particular aspect under 1k, and I think that is a conservative guess. I have been in the high end audio world for 20+ years, besides being a musician, so I have ears for both sides of that coin. The stock mics are clear, better than I expected. I bought the dual xlr adapter so I can pipe in 6 total off board mics. The adapter and stock mics are in aluminum chassis, very solid! That I was not expecting for the price. I can not comment on the quality of the compression or limiting factors within it, that is something I do not intend to utilize outside of my daw. Pick up a set of batteries with a charger, a big class 10 sd card and you are set to go for a mind boggling amount of recording hours. I can't comment on the support part, I have not needed it, and honestly unless it is thrown on the ground I don't think I would. I don't want to take away from the ratings because of that so I 5 stared it. Overall this is much more than I expected and I think will be a valuable tool for anyone when used in the right way, for the right purposes.